Washington – In a stinging shake-up of the Ministry of Lands, Mines & Energy, former President Ellen Johnson-Sirleaf, back in February 2009, relieved Mr. Albert Chie, then Assistant Minister for Energy, along with the assistant minister for Mineral Exploration, Gesler Murray of their positions. 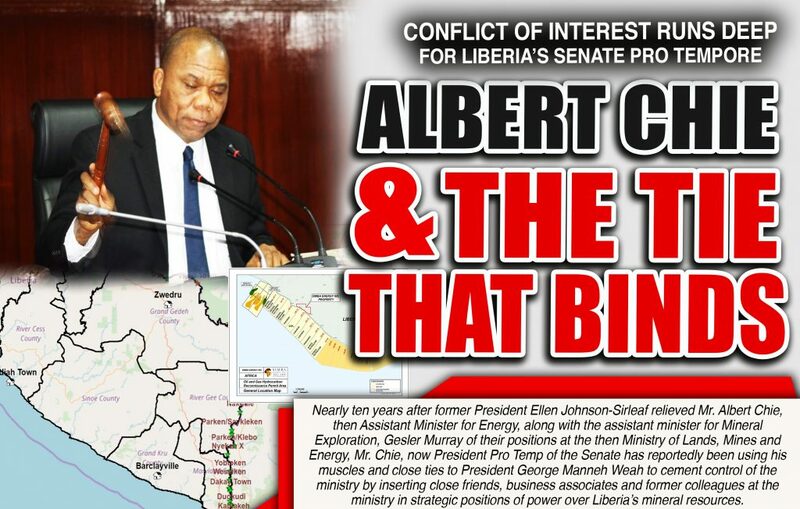 Nearly 10 years later, Mr. Chie, now President Pro Temp of the Senate has reportedly been using his muscles and close ties to President George Manneh Weah to cement control of the ministry by inserting close friends, business associates and former colleagues at the ministry in strategic positions of power over Liberia’s mineral resources. When President George Manneh Weah took office January last year, Mr. Chie worked the clock to ensure that a team of his liking and those under his control would fill all the key positions at the ministry. In the end, he got his wish. The Pro Temp went a step further in convincing the President to wrestle control of the mineral concessions away from the ministry and within close proximity of the Executive Mansion. The President obliged and on February 15, 2018, announced that the ministry would no longer be in charge of handling applications for mining licenses. In effect, the key component of the ministry is now being handled by the President’s office and the ministry of state. Ironically, Section 5.1 of the New Mineral and Mining Law of Liberia gives the Mines and Energy Minister the power to grant reconnaissance license in line with prevailing regulations. “All prospective dealers must write a letter of intent addressed to the Minister of Lands, Mines and Energy with the following documents attached: two passport photographs; Business Registration from the Ministry of Commerce and Industry; Partnership Agreement/Articles of Incorporation. Applicant must fill application form required for diamond dealership (new applicant only). Procedures for Obtaining Mineral Rights/License,” according to the Procedures for obtaining mining rights/License of the Mines Ministry. In addition, Mr. Chie lobbied for his old pal, Murray, with whom Chie worked at the Ministry of LM&E, who also happens to be his partner at the geological consulting firm, Earthcons, to become minister. Emmanuel Sherman, a long-time friend, was named Deputy Minister for Operations. Chie was instrumental in helping Sherman secure a scholarship through a former business partner Guy Pas of Aureus Mining and the pair have been working on the mapping system containing all the various mineral deposits in Liberia. Other Chie protégés were appointed to senior positions at the Ministry, including Carlton Miller Deputy for Planning and Development. Chie, Murray, and the late Mulbah Willie a former Deputy Minister at the Ministry owned the consulting firm where many investors seeking exploration rights used their services to secure large areas of deposits in gold, diamonds, iron ore and other minerals. Earthcons was over the years of economic reconstruction beginning in 2003 the most engaged firm by mineral companies. There was hardly an exploration company that did not use the services of Earthcons. In April 2009, Spatial Dimension won, on an open tender, a USAID funded project to implement a Mining Cadastre Information Management System for the Ministry of Lands, Mines & Energy. The cadastre is a mapping system that pinpoints areas of high concentration of mineralization with GPS coordinates. At one time, only their partner in crime Emmanuel Sherman, a protégé of Chie who used a scholarship offered by Guy Pas, the principal owner of Aureus Mining had the code and knew how to use it. Murray, the current Minister is also part of the cabal still in operation, FPA has learned. Rex Saturh, an Assistant Minister at the Ministry of Lands, Mines and Energy, is also part of the cabal. Mr. Chie even ensured that his sister, Agnes Chie Marshall got a job as Assistant Minister for Administration. Mr. Chie, who entered the Senate following his election in 2015, was influential as Chairman of the Senate Committee on Lands, Mines, Energy and Natural Resources. His election on a white ballot following the 2017 elections offered him the perfect opportunity to continue what he started since the hey days of the Interim Government of Gyude Bryant, probably the most corrupt in the country’s history. It was during the Bryant-era that Chie made most of his money. Len Lindstrom, a Canadian investor and President and CEO of Liberty International Mineral Corp and Liberty Group of Companies, told FrontPageAfrica in 2014 that he lost a lot of money when Chie and many of those who are currently resurrected in Weah administration ran the show at the ministry. Lindstrom explained that he came to Liberia with one intention: to help the post-war nation explore its mineral potential and convince other investors that the post-war nation was open for business. But despite taking the risks in 2004, when investors were still shy about the climate and much of the nation’s infrastructure were in tatters and mineral companies in no rush to do business in a post-war nation on the rebound from war, his expectations fell short. A frustrated Lindstrom, would lament to FPA, nine years after his 2004 ordeal, the pains and lingering headaches which drove him on the edge of belief in a nation he says, has turned its back on the efforts he put in, trying to help resurrect Liberia from the obscurity of the international business community. The investor named Jonathan Mason, who was Minister of Lands, Mines and Energy at the time, Eugene Shannon, who replaced Mason in 2006 and Albert Chie, Assistant Minister for Exploration, and Murray, who replaced Albert Chie as Assistant Minister of Exploration. Others named were Carlton Miller, who replaced Murray as Assistant Minister for Exploration. ECB Jones, replaced Mulbah Willie as Deputy for Operations, John Nylander, and Deputy Minister for Administration and Emmanuel Sherman, Head of the ministry’s Cartographic Department and later replaced Miller as Assistant Minister for Exploration when Miller was shuffled to Assistant Minister of Planning. This is the usual seesaw at the Ministry of Lands, Mines and Energy where due to capacity constraints, the usual suspects are recycled from one government to another. Lindstrom also listed officials he says were signatories to MLME letters authorizing payments to the Ministry of Finance for illegal licenses issued to third party companies over Liberty licensed properties in direct violation of highly-prohibitive court orders. Those officials include: John Kollie, Director of Finance, Cooper Pency, Director of MCIMS and Sam Russ, Deputy Minister of Operations. Ironically, Lindstrom writes that both Sherman and Miller worked for Liberty as geologists during the company’s initial period of exploration prior to their appointment to executive positions at the ministry, and during the period gained first-hand knowledge the mineral potential of Liberty concession areas. This, Lindstrom asserted, coupled with Liberty’s filings and further geological reports submitted to MLME, gave them, and other executives at the ministry, insider confidential information as to the substantial mineral potential of certain properties within the Liberty portfolio, which knowledge and geological data and subsequent reports submitted to the ministry was commonly reported to have been used to entice new investors to greatly desire the Liberty Properties. The deception, according to Lindstrom, constitutes yet another highly unorthodox practice in the inner shrouded workings at the ministry and additional potential for great abuse of government appointed positions and protected information. 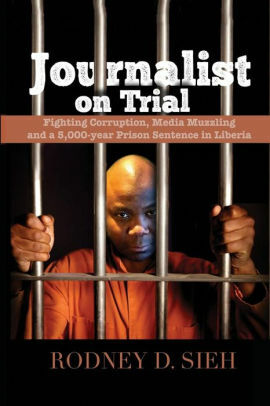 In addition, Lindstrom wrote that former Minister Shannon, Roosevelt Jayjay, Miller and Sherman were also principal signatories to illegal licenses issued by MLME over Liberty Properties, all of whom surely knew and understood the Mineral Law and the constitution of Liberia and consequently had to be fully cognizant of the utter illegality of their actions. During the period, the investor says his company brought in some 21 geologists from Ghana and employed up to three hundred people in the forest, especially contract workers in the outline areas, working hard and heavy, transitioned into mineral expedition agreement. Lindstrom says all of those agreements were ratified under the current regime, under the UP government and have gone through by GEMAP, approved by the Ministry of Lands, Mines & Energy. It was during this same period that Chie and his peers undertook what would later result in one of the biggest schemes involving Liberia’s mineral resources, when they as officials of government were part of a consortium that gave themselves Oil Block 13 in the Mesurado Well. Years later, when the U.S. petroleum giant ExxonMobil finally put pen to paper on the controversial oil Block 13, the conclusion instantly made Chie and a group of select Liberians who happened to have been at the helm of power when the initial negotiations and ratifications were concluded as members of Liberian government, US$3.1 Million richer. As part of the final breakdown, FrontPageAfrica reported in May 2013 that Exxon doled out a total of US$120 million. Out of that amount, US$45 million went to the National Oil Company of Liberia, US$5 million to the government’s coffers as taxes while US$70 million was paid to Broadway/Peppercoast. Out of that US$70 million, sources tell FrontPageAfrica U$S3.1 million was paid out to Liberian shareholders of the block originally owned by Broadway. On paper, Cllr. Jallah, was the only name listed as local owner and in Trust for the Liberian shareholders, to the deal which is said to include former Lands, Mines and Energy Minister Mr. Jonathan Mason and his two principal deputies at the time, Chie, and the late Willie. At the time, it was unclear how much taxes the group, headed by the late Cllr. David Jallah, a former Dean of the Louis Arthur Grimes School of Law at the University of Liberia who is also a former President of the Liberia Chamber of Commerce, had paid into government’s coffers. But FrontPageAfrica has learned that the group was required to pay 15 percent of US$3.1 million into government coffers. Chie was Assistant Minister for Exploration & Research, Ministry of Lands, and Mines & Energy while Willie was Deputy Minister for Operations. Senator Cletus Wotorson, was chair of NOCAL at the time Broadway was awarded the block and the late Mr. Willis Knuckles, was CEO of NOCAL. Broadway was granted the block under a cloud of controversy and a lot of unanswered questions. Chie had served briefly in the Sirleaf administration but was relieved of his post in February 2009 as Assistant Minister for Energy due to murmurs of corruption. Ironically, during the Amos Sawyer transitional government, Mason was the Minister of Lands, Mines and Energy when he granted Broadway an offshore block. During the Taylor administration, after TGS announced the conclusion of its seismic program in Liberia, Mason was Broadway’s consultant and took Broadway to NOCAL to re-claim ownership of its offshore block. Broadway even contacted TGS NOPEC claiming offshore ownership. NOCAL informed them that any concession granted during a transitional government and during the active years of war were not valid but deemed fraudulent and they backed off and signed a document acknowledging such. During the transitional government of Bryant, Mason was named Minister of Lands, Mines and Energy – and sat on the board of NOCAL along with Cletus Wotorson, a former Senator from Grand Kru County and Knuckles was Chairman of the Board. Broadway was awarded a block through “bid” even though they did not have any history of exploration or money. Mason also gave the makeshift company one million acres of land to mine, fact which was confirmed by Gary Allsopp a Broadway Executive in a 2007 interview with FrontPageAfrica. After the transitional government, Mason set up a private office within the Broadway offices located in IB Bank on Broad Street and resumed his role as a consultant for the company. When the iron ore issue and conflict of interest questions started to dog Mason, Broadway asked him to move and he set up shop further down the street on Broad Street, near Randall Street. With the deal now concluded with Exxon, the group of select Liberians headed by Cllr. Jallah and silent partners, including Chie were in line for a huge payday. Cllr. Jallah was earmarked to receive a bonus of US$44, 700 and total of US$3.1 million – and up to the time of his death in May 2018, did not name who his partners were. In documents obtained by FrontPageAfrica at the time, Peppercoast Petroleum PLC (“Peppercoast”) noted that it recognized that under the Revenue Code of Liberia, as amended, it is obligated to withhold certain taxes when making payments to residents. The company reportedly has upon completion of the deal terminated ties to all those listed as recipients of payments will result from deal completion bonuses, termination of employment contracts, cash settlement of option agreements to acquire Ordinary Shares in the Company, capital distribution to all Peppercoast shareholders, including (one Liberian-Cllr. Jallah). Payments to those listed is due one month after the completion of the deal. Peppercoast reportedly consulted with a local accounting firm, VOSCON to calculate net payments and Peppercoast would withhold the appropriate tax as advised. Payments were reportedly paid net to the recipient’s bank account with the deducted tax paid to the Ministry of Finance. The capital distribution was likely made after the Company has been put into liquidation and is at the hands of the liquidator and not the directors. In 2013, Sirleaf signed into law an act which will required parties to reveal who the beneficial owners of shares in a corporation or a bank account are. Conflict of interest issues dogged the deal from the start. The manner in which the sale was completed raises a number of conflict of interest issues likely to keep the controversy surrounding block 13 lingering in a state of uncertainty and eclipsed by a cloud of potential legal setbacks which has put the Government of Liberia on the edge. Broadway, a relatively unknown company at the time, had reportedly borrowed over US$50 Million Dollars using block 13 as leverage but the company did not have the resources and finances to explore the area. The company reportedly pitched the sale of the block to a Canadian company, Pepper Coast, whose cash and equivalents for year December 31, 2010 was listed at only $37,403.00 Canadian Dollars. Liberia is yet to recover from the impact of the Broadway – Block 13 saga engineered by Chie and others. In March 2018, Global Witness investigation showed Exxon’s 2013 purchase of Liberia’s Block 13 oil license likely enriched former government officials who may have illegally owned the block. The state oil agency NOCAL also made unusual, large payments to senior government officials who authorized the 2013 deal. The GW evidence showed that the company was likely part-owned by former Mining Minister Jonathan Mason and former Deputy Minister Mulbah Willie. Mason and Willie are suspected of granting the oil block to a company in which they held interests while they were also ministers in 2005, which was illegal under Liberian law. Exxon knew that Block 13 was originally awarded through bribery and that its purchase of the oil block could enrich former officials who might have been behind BCP. The current production sharing contract (PSC) for LB-13 block with ExxonMobil and COPL – where the well was drilled – was terminated effective September 25, 2017 but COPL has expressed interest in getting another shot at drilling. In 2017, the company’s technical team saw opportunity in other areas of Block LB-13 and continued to perform geological and geophysical analysis in those areas. Ironically, Mr. Chea was a full-time consultant to NOCAL during the Sirleaf administration and also happens to be a close friend of Frank Timis of African Petroleum which once used Mr. Chie’s sister, Agnes’ house near RLJ community as an office. The same sister, Chie personally insured was placed strategically at the ministry when president Weah won the presidency in 2017. Mr. Chie’s entire family worked for African Petroleum when Mr. Timis’ AP announced a fake oil discovery to boost share prices on the Australian stock exchange. In the end, there was no discovery and shares tanked as investors lost millions. With Mr. Chie’s puppet-master role in the current administration, many diplomatic and industry observers fear, the wheeling and dealings which dragged the Sirleaf administration down the mud for the twelve years appears to be showing its face under the Weah government, with Senate Pro Temp Chie calling all the shots.